The world outside the laboratory was a big scary place. Unsure of how to deal with it, Renee latches onto the biggest, baddest, and sexiest,warrior around. Sharp toothed and with ice in his veins, Viktor’s violent side should have sent her running, but instead, she finds the courage to face her fears –and tame the lizard. FTC : I bought this. I love Eve Langlais. Her characters are bitchy, the story-lines are funny and I feel that I’ve stepped down the rabbit hole every-time I read one of them. This one was shape-shifters with a Croc hero … I was powerless to resist! Renee is a bit of a revelation as a heroine. I liked that she completely embraced her freedom, trying everything until fear gets too much for her. She was a very strong woman and I respected her … I felt as she learned more about herself so did I! The book was very funny and sweet! Is there a good side plot? There is and it has a plot within a story arc which I liked. it was a little bit Dr Frankenstein and little bit Miss Marple… I loved! I’ll admit I haven’t read the first couple in the series but I had no issues following it. When Renee’s secret is revealed.. I laughed! People who love snarky characters, Alpha heroes and mad-cap antics! I’ve enjoyed all the books of hers that I’ve read. 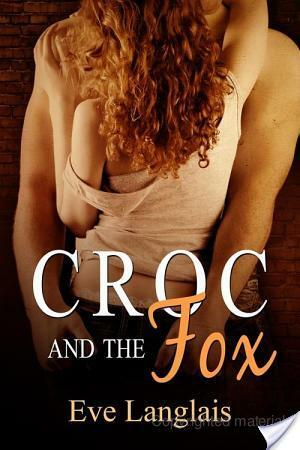 The croc/fox combo sounds interesting. I don’t think I’ve ever read a were-croc story before.